»Forums Index »Halo Custom Edition (Bungie/Gearbox) »Halo CE General Discussion »Can extract the model of my map and use it back on 3ds max? :´´(. I don't want to release my map as multiplayer, I know I could, but I want to make something good. I know there are scripts to create portals, but when I added the scriptsand it didn't work. So it takes me less time link the bsp on 3ds max than scripting codes. There are a few programs that can accomplish this. 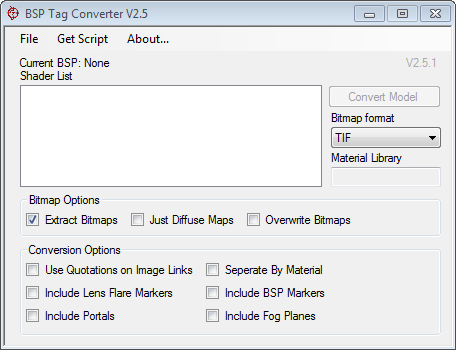 BSP Tag Converter V2.5 is one of them. It allows you to import the BSP, Terrain Portals, Lightmaps, etc. And it keeps the materials and UV mapping. Only problem is, like all BSP importers, it doesn't import any +sky materials and doesn't import anything as render-only or collision-only. This geometry will have to be remade in order for the BSP to be exported again properly. Did everyone seemingly forget that Adjutant gained the ability to rip Halo CE content including BSPs? I've found it very helpful personally, I haven't tested but I think it and Aether together could also work.